Selecting the right electrician for your electrical project at home should be as easy as one, two, Three Phase Electric. We handle all types of electrical wiring, from single phase power to three phase power. 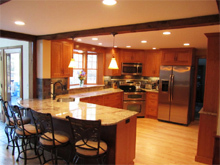 We handle new installations, renovations, and maintenance. Our electricians have years of electrical experience and are up to date on licenses and the latest products, techniques, and certifications from numerous manufacturers.